"The colours are brown and blue. They blend beautifully, and will lend themselves to pretty combinations either as guernseys for footballers or lacrosseurs. or blazers for cricketers, bowlers, tennis players or rowing. On a hatband they look artistic, and it should be possible to agree upon a device which all interstate players may wear upon their hats, caps or blazers. This match marked the official unveiling of South Australia's new sporting colours. The brown jumper was paired with navy knicks and worn loose (or outside the jumper) to show-off the turquoise panel along the base. Virtually all of the States participating in the inaugural carnival wore newly designed uniforms for the occasion. South Australia were no exception, adopting this lace-up jacket. - the navy blue knicks changed to white knee-length shorts (this was a common trend at this time with a number of representative teams and league clubs changing to the new, not-so short shorts). Due to the cold weather during the carnival a number of players wore the June 1908 jumpers underneath the new lace-up jackets (see image above right). A return to the June 1908 uniform, minus the turquoise band along the base of the jumper. Note: the top of this band is still visible in some action shots from the 1909 matches on players whose jumper had become slightly untucked. However, the new white shorts were worn higher on the jumper than the old knicks and obscured the band when the jumper was fully tucked-in. 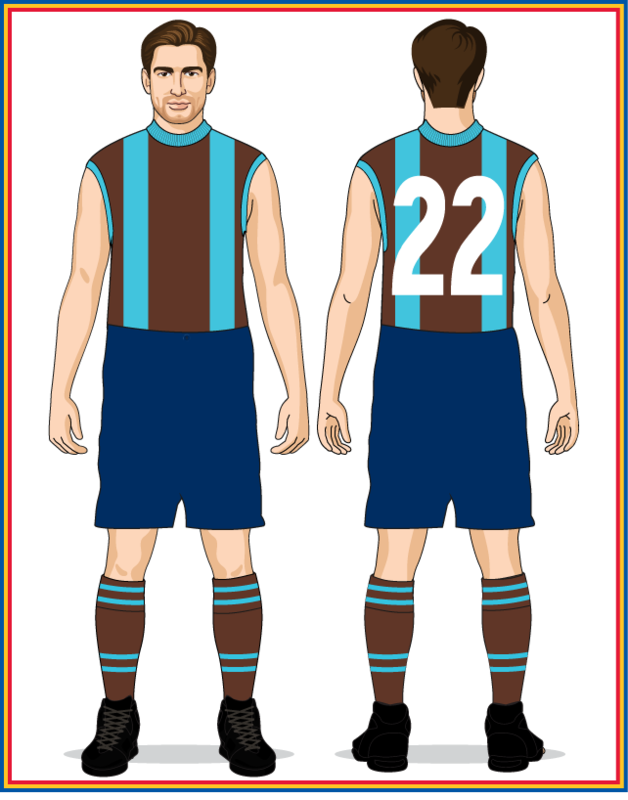 The wearing of numbers by all teams was a unique feature of the second Australian football championships and the South Australians added a white number panel to the back of their jumpers with undersized black numbers. - 1905: Port Melbourne FC wore numbers throughout the season. 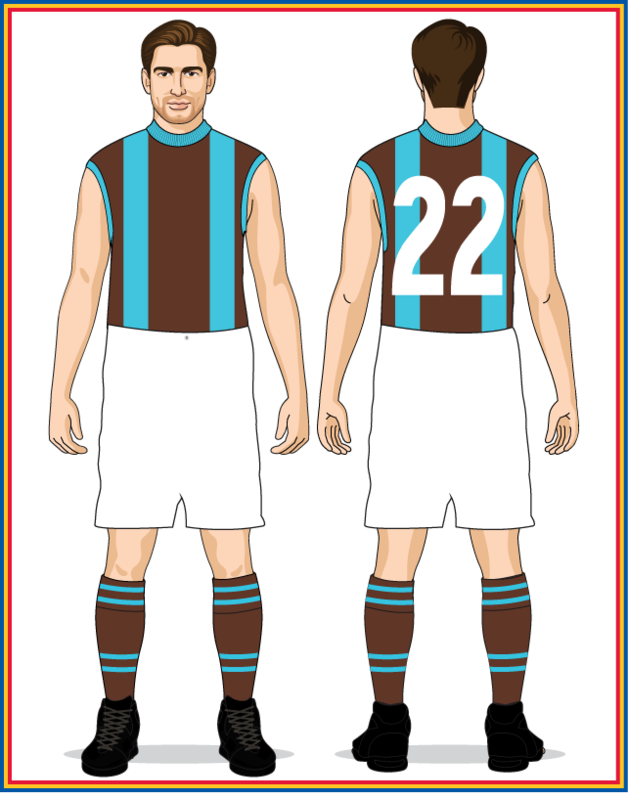 Later in 1911 the VFL clubs adopted numbers during their finals series and by 1912 numbers had become a standard part of club and representative uniforms. The shipping strike that had plagued Australia since May finally ended in late-July, allowing the South Australian team to wear their new jerseys for this match at the MCG. The "new" jumpers were a return to the design worn from 1909 to 1914. A National Carnival was again the catalyst for change, with the South Australians replacing the thin band across the front and back shoulders of the jumper with a large turquoise band. The gap between the two bands on the sleeves also became much wider. NOTE - a handful of players wore jumpers that had the normal width bands on the sleeves. These jumpers also had no dividing line between the neck of the jumper and the thick turquoise band across the shoulders. 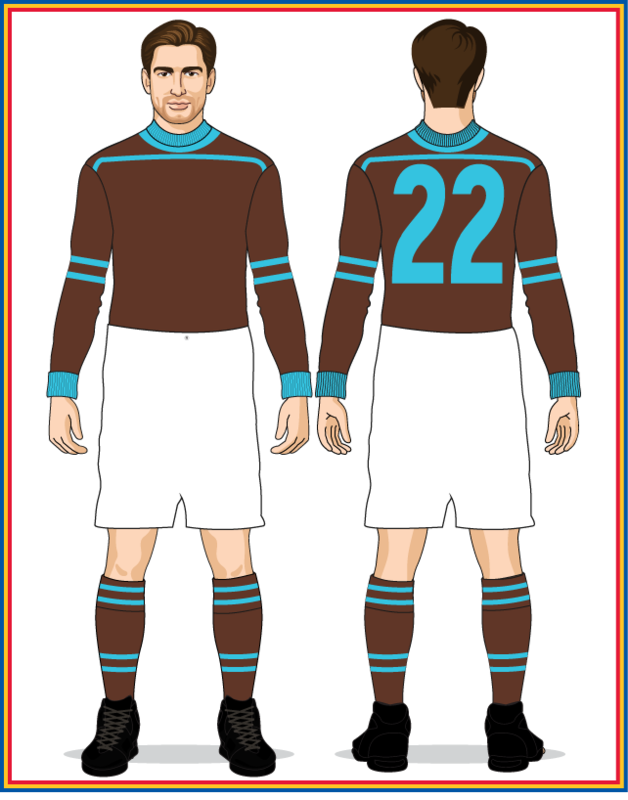 The gap between the two bands on the sleeves returned to the pre-1921 width, and all jumpers now had the dividing line between the neck and the band across the shoulders. The turquoise band from the old design was changed to two turquoise braces and the numbers changed from turquoise to white. In the days after the match the SAFL decided to wear blue knicks in all future interstate matches, due largely to the fact both Victoria and Western Australia wore white knicks at that time. Following the 1924 National Carnival the search for another design commenced, with the SAFL eventually settling on this design; the first to feature an S.A. monogram on the jumper front. The other change was the move from dark blue to navy blue knicks. As had become the norm, the tri-annual National Carnival triggered another uniform change, with the SANFL adopting a larger (and more legible) monogram for their new jumpers. The majority of the players wore short-sleeved jumpers but a handful of players wore the long-sleeved version pictured above right. For the 1928-29 seasons the long-sleeved jumper was no longer issued and the sleeveless design became the official uniform. For this match played at the Adelaide Oval, the entire team fought off the cold weather by wearing a set of the 1927 long-sleeved jumpers under their 1928 short-sleeved kit. The author is a proud member of the Australian Football Heritage Group (AFHG), which is dedicated to preserving Australian football's history. © David Eastman, 2013-19. All rights reserved.